To receive a message when we take orders for pails, sign up for our emails. Pails like this are usually available on our dry goods orders and wheat orders. Our pails are made from High Density Polyethelyne (HDPE). They are food grade, white, and 90 mil. These pails are round to allow for the best airflow around them. They can be stacked 4 high. A 6 gallon pail holds about 45 pounds of small grains such as wheat, rice, and oats. A 5 gallon pail holds about 33 pounds. To seal your pail with a tear strip lid for the first time, pound the lid on with a mallet or stamp on it with your feet. To open it, remove the tear strip and pry off the lid. The gasket in the lid will form an airtight seal every time you close it. 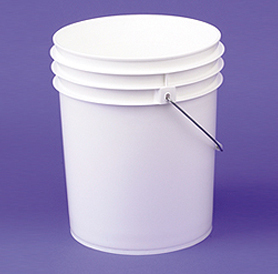 Tear strip lids fit 3.5 – 7 gallon pails, including both 5 and 6 gallon plastic pails. Pails sealed with tear strip lids are stackable. We also have gamma seal lids available. These are especially handy for pails that you open and close frequently. Large pails are great for storing bulk grains and other dry foods. You can use this pail as an everyday storage container, or you can keep grains and beans in it long-term. Bulk grain storage requires a little bit of planning, but it is one of the wisest things you can do to save money on your groceries, and be prepared in case of an emergency. When stored properly, wheat can easily last six to eight years or more, without losing any of its nutritional benefits. The trick to wheat storage (and the storage of any bulk grain for that matter) is to keep out the oxygen, keep it cool, and keep it dry. Six gallon pails are perfect for this. For short-term storage, simply keep your grain in a pail to keep it dry and rodent proof. We highly recommend purchasing gamma seal lids for pails you will open and close regularly because they are so easy to put on and take off. Oxygen absorbers literally absorb oxygen from inside your pail. In fact, once you open the package, they will start to absorb oxygen from the air itself, so it’s important to work quickly. Oxygen absorbers only work one time; their purpose is to keep your grains fresh in long term storage. If you will be opening your pail on a daily, weekly, or even monthly basis, you won’t benefit from oxygen absorbers. Use them when you plan to keep a pail of grain or beans for 1 to 10 years, or even longer. Ideally, the room you use for wheat storage should be fairly cool, at least most of the time. But even if you don’t have a place like that, you can probably still store grains long term. Our family doesn’t have an ideal place for our storage wheat, and we’ve never had any issues with spoilage or with bugs. Our pails of wheat are kept outside in our garden shed. Perhaps we’ve been lucky, but I tend to think that if your grain is in a water tight pail, it will be just fine wherever you keep it. If you keep your wheat in a basement or outbuilding, set the pails on pallets or boards to avoid direct contact with concrete and increase circulation. and be sure to write the date on your pails so you can use up the oldest wheat first, and replace your storage supply as it dwindles.